I even went through 7/8ths of a masters in Library Information Science, thinking (mistakenly) that since I had such a passion for books, that was the career for me. Bad graduate school choices aside, books have undoubtedly shaped my life, supporting my dreams or helping me make a change when the time was right. 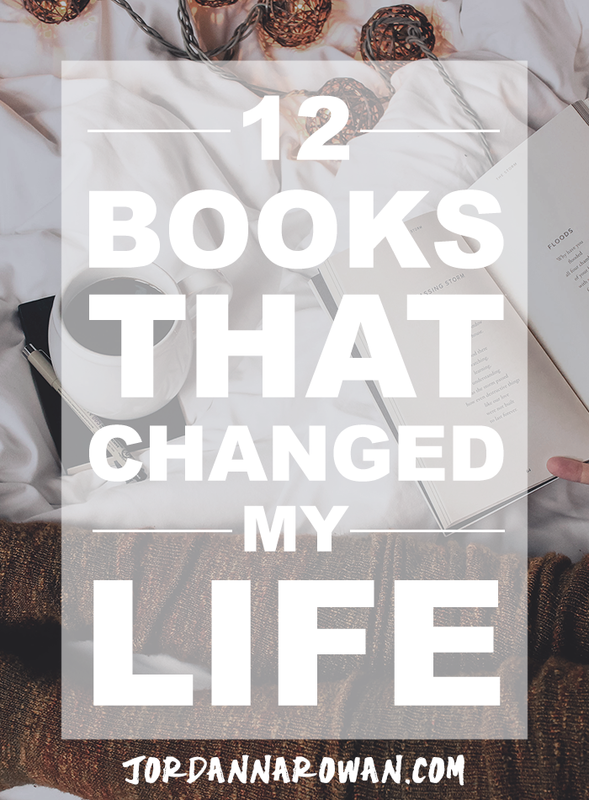 Today I'm sharing with you ten to twelve (I think twelve) books that have shaped my life in some way or another. These are a mix of fiction and non-fiction of many varieties, and you may find yourself a little baffled by the collection. But hey, it's like one of those treat bags you used to be able to get at the corner store for a dollar. You never knew exactly what was going to be in it, but there was always at least one thing you liked. And you don't even have to pay a dollar. I'll admit it, I found out about Amanda Palmer through Neil Gaiman— but this book truly holds its own as a book that changed my life. It reminded me that the people around us are all too willing to catch us, if we're only brave enough to give them the chance. I can't count the number of times I cried reading this book. Most of what we do during our day is habit— and that's not necessarily a bad thing. If you had to actively remember how to do simple tasks like driving or washing dishes, life would be exhausting. Duhigg shows us how we can break out of this cycle when we need it most, take action, and change our lives by forming habits— the good kind. Oh Brené, how I love thee. Reading this book was like a thousand small epiphanies, and completely flipped my ideas about vulnerability on their head. Vulnerability is not our greatest weakness, but our greatest strength, allowing us to connect deeply with each other as humans and lead with compassion, kindness, and bravery. My favourite fiction series of all time. HDM taught me that it was okay to be flawed, to be fiercely passionate, and to be a girl that takes action in her own life. He gave me one of my all-time favourite characters, Lyra, and inspired in me a life-long passion for writing fiction of my own. This book revealed to me one face as a child, another as a teenager, and another as an adult. When I got to the end of this book, I flipped it over, and started reading it again. Something about this book validated all the things I felt about childhood— how adults seem to grow up and forget how scary, unfair, and often unpleasant it is to be a small thing under the control of others, and yet how magical and powerful and wild. Harry Potter was an unshakeable foundation for me growing up in a way that nothing else was. Reading Hermione taught me that yes, in fact, there were other people just like me all around the world— and we weren't the loser, we were the hero (even if we were insufferable know-it-alls). These books stoked a life-long love of reading and helped me to realize that I too wanted to be a story-teller someday. I wish I could say more about this book without spoiling the ending! This was my husband's first book recommendation to me, and while I was extremely hesitant to read it, thinking it would be dry, it's now one of my all-time favourites. The ultimate sweeping family saga, complete with one of the most repulsive characters ever written. Best. Part auto-biography, part nature-writing, part shadow-biography of T.H. White, this book mesmerized me from start to finish. Every time I think of this book, I have a little shiver of wonder. Macdonald writes with fierce beauty on things that are at once incredibly unfamiliar (falconry) and intimately familiar (grief, love, and slowly unclenching your iron-fist grip on life). Have you ever wanted to be on a quest? This book will make you want to take on a quest. I've never felt so powerfully compelled to run out the door and be swept along by the road. The best thing is that Guillebeau is right: it really is in the pursuit that you find the joy and purpose. I challenge you to take up a quest of your own, no matter how silly it might seem, or how scared you might feel. The reading of this book is currently transforming both my life and my business in the best way possible. If you've ever felt like you're taking minuscule steps in a thousand different directions and not getting anywhere, this is the book for you. I'm seeing more success in my business, and more happiness in my every day life. Greg, cheers. A reading experience that has yet to be matched. Magical, terrible, wonderful, haunting, and written in some heart-stoppingly gorgeous prose, this book makes me want to rent a cabin and spend several months penning my masterpiece. It may also inspire you to take up Greek, or start drinking excessively. I didn't know books could have all the things I loved all in one place. I didn't know I could do the same. A book that really shook up my business thinking (and what a fabulous beard, really). Before reading, I spent an awful lot of time trying to figure out how I could make my business like the businesses of others to be more successful, not realizing I was throwing away the one thing that could make me successful— my unique perspective and personality. Weird is good. I promise. I'm not even finished reading Tools of Titans, by Tim Ferriss, and already it's changing my thinking in a total unexpected way. If you want to become the happiest, healthiest, wealthiest, and wisest version of yourself, pick this one up. Did you get all inspired and tingly reading this? Click over on the left to share it with a friend!